The One-Line: Inside a mortuary, two dimwitted girls accidentally embalm themselves, causing a chemical reaction that reanimates the dead and forces the audience to find the cure or be overrun by zombies. Extras - lots of zombies male or female. Set: Simple. Only two doors needed. Running Time: 90-120 minutes as a full-length with audience participation or 35-45 minutes as a one-act with out audience participation. Synopsis: When Karen’s friends visit her during her first night working at the mortuary, two of them accidentally embalm themselves causing a strange chemical reaction within their bodies. With more of their carelessness, they spread the infection to the dead bodies causing them to reanimate. Zombies stock the group as they try to find an antidote to the infection. The audience must find the chemicals to stop the takeover! But it won't be easy. Along the way, the various groups will encounter other zombies in different locations, and if they're not careful, participants may get turned into zombies themselves! 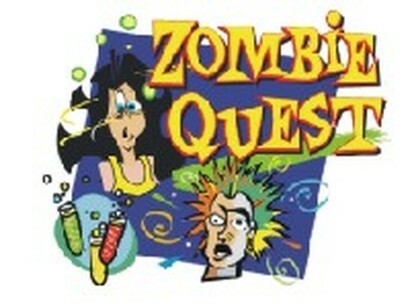 For an evening of over-the-top sci-fi fun, present "Zombie Quest."